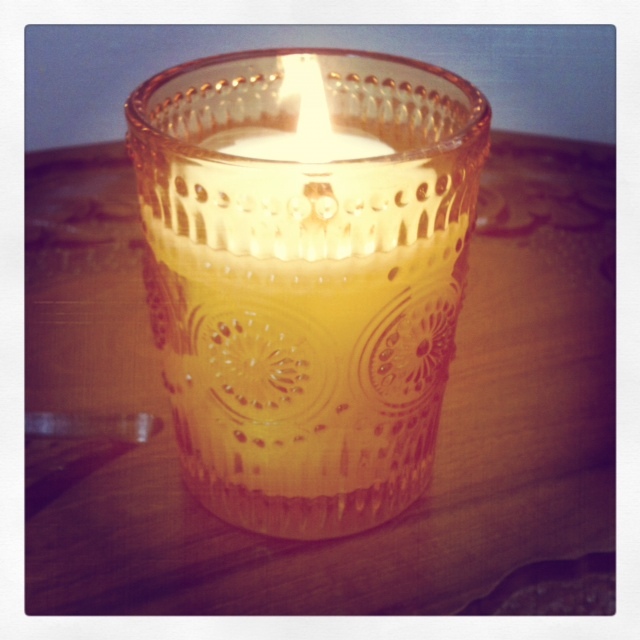 At one point today, I had a cup of pumpkin spice rooibos tea in hand, a plate of leftover pumpkin lasagna and a pumpkin butter vintage candle by Woodwick crackling in the corner. 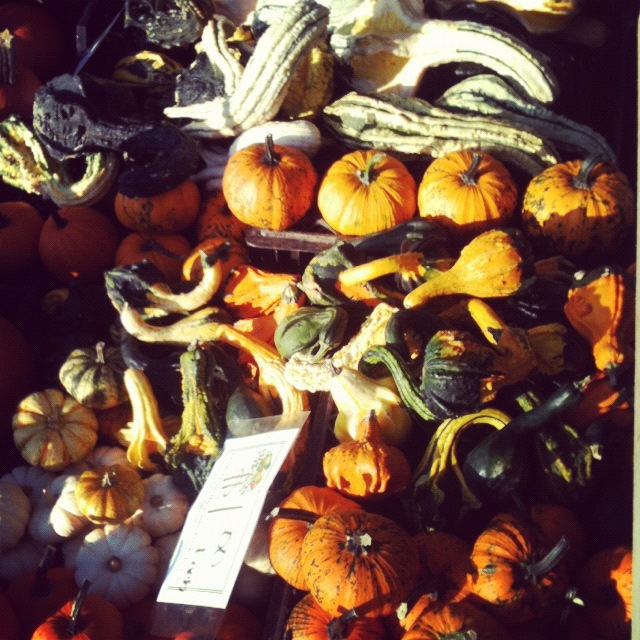 It was a magical fall moment, not to mention seeing the sunlit pumpkins at my favorite farmers market this morning. So, needless to say, I have pumpkin on the brain. It doesn’t help my fall-obsessed condition that it truly feels like fall in our house, what with our heating unit going out on the first 40-degree day. Looks like it will need to be replaced, and who knows how long that will take? In the meantime, I will be holed up at my home office, snuggled into fuzzy boots and my down jacket, with something pumpkin-apple-ey in my hand for added warmth. I recently got a subscription to Food & Wine Magazine and have been loving my recipe emails from them. I couldn’t resist the Pumpkin Lasagne recipe they sent my way this past week. Oh goodness, it was so good. A great meatless meal to throw into the mix, complete with all the major food groups: pumpkin, parmesan cheese and something green (rainbow chard, in this case, another love of mine). Adapted from Food & Wine (I cut back a bit on the cream). In a large nonstick frying pan, heat the oil over moderately low heat. Add the onions and cook, stirring occasionally, until translucent, about 5 minutes. Increase the heat to moderately high and add the chard in batches, 1 teaspoon salt, 1/2 teaspoon pepper, 1/2 teaspoon sage, and 1/4 teaspoon nutmeg. Cook, stirring, until the chard is wilted and no liquid remains in the pan, 5 to 10 minutes. Heat the oven to 400°. In a medium bowl, mix together 2 cups of the pumpkin, 3/4 cup [of your cream or cream substitute, such as buttermilk], 1/2 cup Parmesan, and the remaining 1 1/4 teaspoons salt, 1/2 teaspoon pepper, 1/2 teaspoon sage, and 1/4 teaspoon nutmeg. Pour the milk into an 8-by-12-inch baking dish. Top the milk with one third of the noodles, then spread half the pumpkin mixture over the noodles. 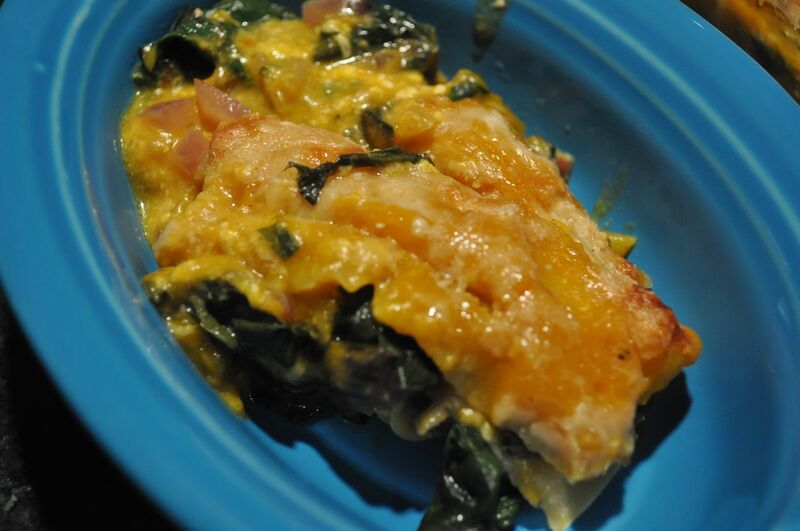 Layer half the Swiss chard over the pumpkin and top with a second layer of noodles. Repeat with another layer of pumpkin, Swiss chard, and noodles. Combine the remaining 1 cup of pumpkin and 3/4 cup of cream. 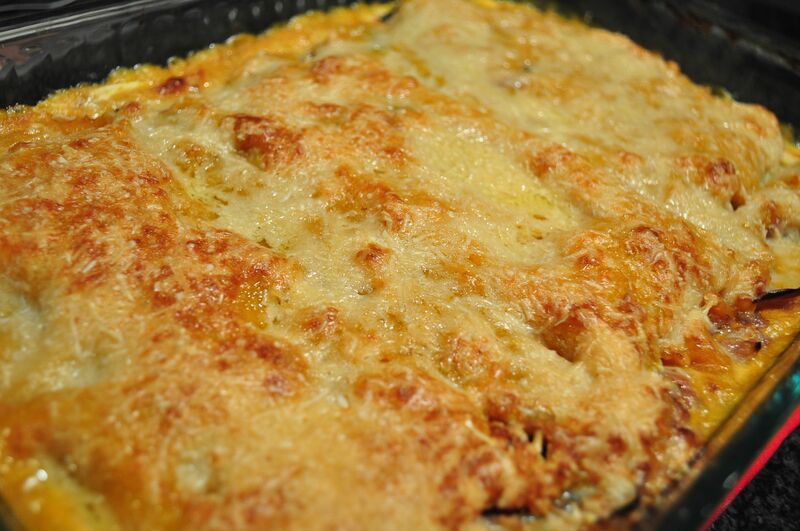 Spread the mixture evenly over the top of the lasagne, sprinkle with the remaining 1 cup of Parmesan. Cover with aluminum foil and bake for 20 minutes. Uncover and bake until golden, about 15 minutes more. And voila! Lots of leftovers, too… OK they lasted through lunch. 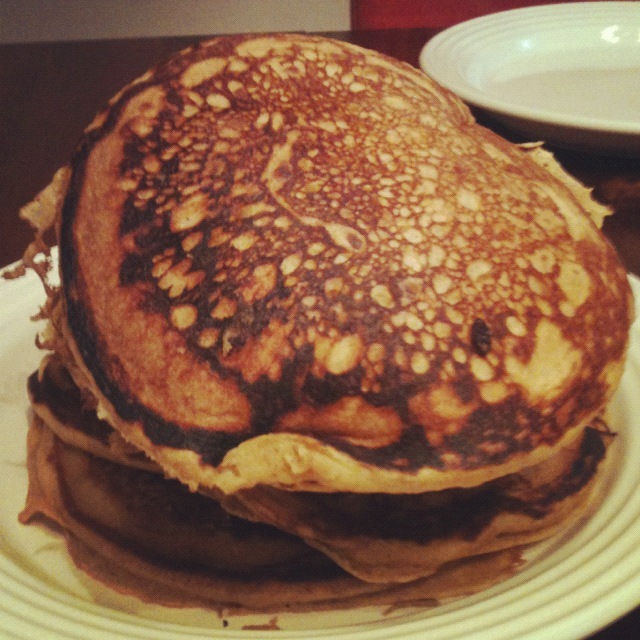 And earlier this month, I made pumpkin pancakes with my friend Bridget while we were staying with them in Annapolis (good fuel for BodyCombat training). And next on my pumpkin to-do list, a cheesy-bready baked pumpkin recipe by Ruth Reichl. Let me know if you beat me to it! What are some of your favorite pumpkin recipes?